Elliot Carlson's biography of Captain Joe Rochefort bringsRochefort to life as the irreverent, fiercely independent, and consequentialleader that he was. 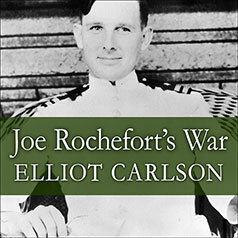 Elliot Carlson's biography of Captain Joe Rochefort is the first to be written of the officer who headed the U.S. Navy's decrypt unit at Pearl Harbor and broke the Japanese Navy's code before the Battle of Midway. Listeners will share his frustrations as he searches in vain for Yamamoto's fleet prior to the Japanese attack on Pearl Harbor and share his joy when he succeeds in tracking the fleet in early 1942 and breaks the code that leads Rochefort to believe Yamamoto's invasion target is Midway. His conclusions, bitterly opposed by some top Navy brass, are credited with making the U.S. victory possible and helping change the course of the war. The author tells the story of how opponents in Washington forced Rochefort's removal from the decrypt unit at Pearl and denied him the Distinguished Service Medal recommended by Admiral Nimitz. In capturing the interplay of policy and personality and the role played by politics at the highest levels of the Navy, Carlson reveals a side of the intelligence community seldom seen by outsiders. For a full understanding of the man, Carlson examines Rochefort's love-hate relationship with cryptanalysis, his adventure-filled years in the 1930s as the right-hand man to the Commander in Chief of the U.S. Fleet, and his return to code-breaking in mid-1941 as the officer in charge of Station Hypo at Pearl Harbor. He traces Rochefort's career from his enlistment in 1918 to his posting in Washington as head of the Navy's code-breaking desk at age twenty-five, and beyond. In many ways a reinterpretation of Rochefort, the book makes clear the key role his code-breaking played in the outcome of Midway and the legacy he left of reporting actionable intelligence directly to the fleet. An epilogue describes efforts waged by Rochefort's colleagues to obtain the medal denied him in 1942, a drive that finally paid off in 1986, when the medal was awarded posthumously.